There definitely is more than a nip in the air these days in my part of this World. The air is crisp with a sharp chillness to it and the days are short, very short with limited time to finish our chores. But no, we definitely are not complaining. As this is the time of the year that we look forward to. With all year around humid, hot, Balmy, tiring temperature this is the time that gives us respite. But this time That year(2012) was a different story all together. December in Tokyo is a numbing affair, incomparable to what we experience here. The layers of clothes, coats, boots, caps, comforters or glasses of warm sake were not enough to keep us warm. All we felt like was to stay in and watch the world go by through our huge glass windows. No, not even the pretty Christmas trees or the frolicking lights nothing could lure us to join the happy crowd. On days when we felt brave we covered ourselves with layers of winter clothes and went down and sit at the Tully's coffee shop in the ground floor Eating area of our Apartment complex. The hot coffee felt like magic and even the then 3 and half year old wanted to share the warmth. This continued till one day I met them, not together, not on a same day but eventually the three of us met and hit it off instantly. Apart from the fact that we all were mothers to three super active kids or belonged to the same country nothing was common between us. We belonged to three different states speaking different languages and bearing different customs...yet we became friends. Everyday we met over tea or coffee and we took turn to host the gathering. While the three kids fought and played we discussed life, giggled, gulped down cups of warm beverage and forgot how far we were from home. The unbearable winter nightmares soon changed into enjoyable moments. While the room heaters hummed comfort to our numb cold bodies, The friendship filled our hearts to a fudgy warm feeling. Soon we started to venture out with our kids in the stroller. once the husbands waved off to office we fed the kids, took them to parks and in the late afternoon when they slept off we went to our nearby shopping arcade for food and daily groceries. We raided the nearby lanes and bylanes, did window shopping and experimented into the unknown sphere of Japanese cuisine. We tried many dishes, some we loved, some we could not fathom. but the experience made it all worth. and today when I look back I dont feel any void, rather I relive and cherish those moments like nothing else. 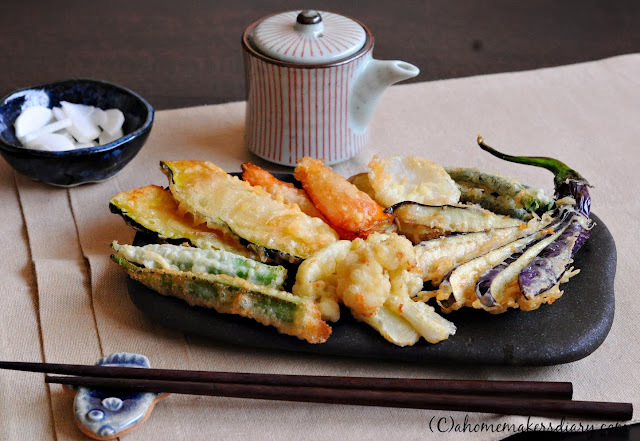 Just the way I recreated this Japanese Classic called Tempura a few days back at home. 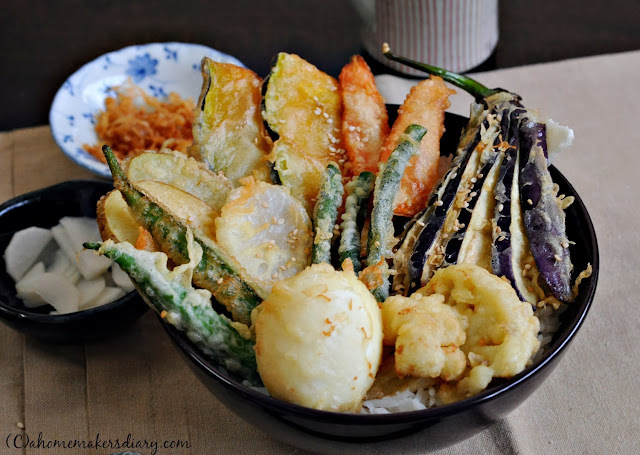 Tempura is a battered and deep fried dish often made with fresh vegetables and sea food. Its one of the most popular dishes in Japanese cuisine. Every-time we wanted to eat it we had to wait in the longest que in the whole of the huge food court. Tempura is best enjoyed piping hot, just out of the wok with some dipping sauce or with a bowl of Japanese rice sprinkled with sesame seeds. Even hot crispy Tempura on a Soba or Udon noodle soup is very popular among Japanese people. 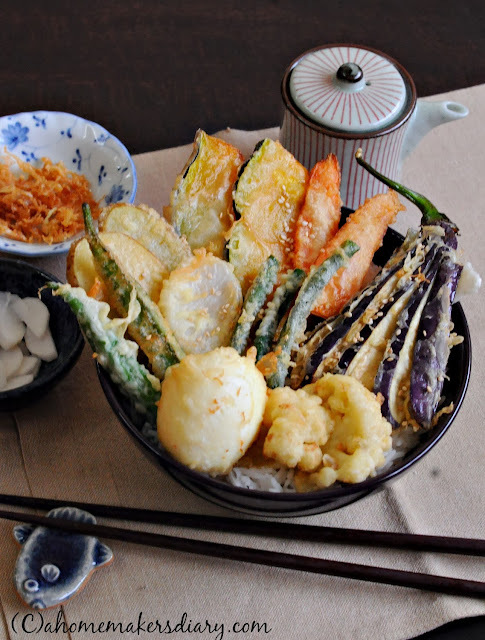 Tempura with rice is known as Tendon and is a very filling meal in itself. Tendon is served with some Daikon radish pickle, The bits and drops of fried batter called tenkasu and a sauce called tentsuyu (Japanese Dry Fish stock or Dashi, Mirin and Soy sauce). The said shop where we used to frequent always served Sea food tendon with various white fishes, prawns and a soft boil egg tempura with few Shisho leaves, Kombu (seaweed) and Okra tempura thrown together. Breaking open the egg and watching the soft yolk melting into the rice was almost ceremonial. It made us salivate and dig into the sunny yellow creamy rice with our chopsticks. If we trace back in History It has evident that Tempura in Japan was brought by the Portugese, who in turn might have learnt it from our very own batter fries (pakoras) from their colony in Goa. But unlike Indian batter fries, Tempura is very light and airy with a thin yet very crisp outer layer covering the fish or the vegetables. I have patiently waited and watched the chefs making light like air tempuras in that said shop and learned a few tricks. Here is my simple recipe with ingredients all available in your home. Make it once with the freshest vegetables you can lend your hands on and warm up a chilly winter afternoon. 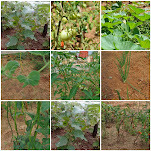 Fresh vegetables like Ladies Fingers, Carrots, Potato, Sweet Potato, Thin long Brinjals, White Radish, Beans, Cauliflower, Pumpkin etc. You can also use snowpeas, asparagus, shisho leaves, Shitake Mushrooms etc. If you can get some Japanese short grain rice Cook it as per package instruction and keep aside. Keep it warm. Peel and cut the radish lengthwise. Slice it finely. Mix the rest of the ingredients together till the sugar melts. Check the taste and if needed adjust the sugar and salt. Place the radish in it. cover and keep aside for couple of hours. It will soften and absorb the sweet sour taste from the vinegar mix. Mix everything together till the sugar melts. Keep aside till needed. 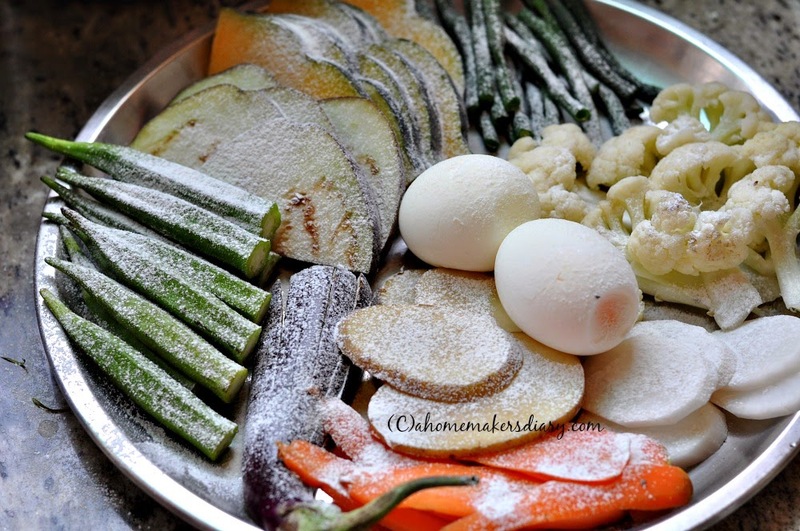 First prepare the vegetables by thoroughly washing them under running water. Dry them properly and then with a clean and dry knife prepare them as mentioned below. Potato: peel (I prefer skin on) and slice them thinly. Radish: peel and slice diagonally. Okra: cut off the stem end and keep aside. Pumpkin: Clean the seeds and piths and slice thinly with skin on. Cauliflower: separate medium size florets and cook them in salted water for 3-4 minutes. Shake the excess water and dry them out with absorbent paper. Brinjal: Cut in half lengthwise, try to keep half of the stem. Place the cut side down on your chopping board and slice thinly on one side of the brinjal (dont cut through all the way to the stem) in the shape of fan. Using your palm press it down lightly to fan out the slices. Carrot: Peel and thinly slice. 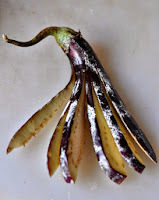 Beans: cut of the stems on both parts and diagonally cut in half. If needed you can steam them. Bring a pan of salted water to boil. Submerge the eggs in it and cook exactly for 5 minutes. Take out and place them in a bowl of iced water. Let them cool down completely for at least 10 minutes. Carefully peel and keep aside. Once all your veggies are prepared sprinkle them with All purpose flour. This will help the batter to cling to the veggies. Make sure all your vegetables are dry before doing this step. Place enough oil (I used white oil) for deep frying in a heavy bottom pan. As per many website the oil should be between 160-180C. In my case I just check by dropping few drops of batter into it. I it sizzles and immediately comes up on the surface, I know my oil is ready. While the oil is heating make the batter. Mix salt, egg and water and lightly whisk to mix it together. Add the flour using a sieve and mix to incorporate together. Do not whisk it vigorously as that will activate the glutten in the flour and you will end up with heavy oily tempura. Now Pick a slice of vegetable coat it in the batter and immediately place in the hot simmering oil. It will sizzle. Repeat the same with few more pieces of veggies, but do not over crowd the pan. Once the side is light golden in colour flip it. I use chopsticks to do this job, you can use a small spatula. Once both the sides are golden take it out and shake off the excess oil. Place on few layers of absorbent paper. Using a slotted spatula take out the fried batter bits and place them on absorbent paper too. Repeat with all the vegetables in a similar manner. To fry the egg use your hand. Sprinkle flour on it and then dip the whole egg in the batter. Scoop out and place in the hot oil. Fry till golden and place on the rice. 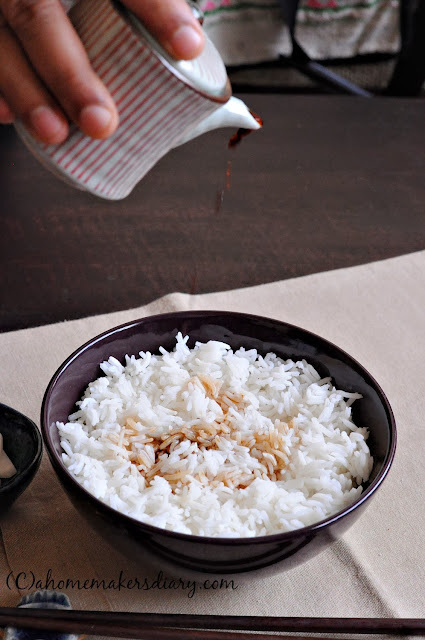 Serve hot with some dipping sauce or on a bed of steamed white rice drizzled with The sauce. Place the pickled radish, tenkasu bits, roasted sesame and sauce in different bowls. Let everyone adjust the accompaniments as per their likings. Its a beautiful recipe of shared meal. If you have a Electric fire or induction cook top you can cook the tempura near to the table and serve them piping hot and crisp just out of the pan. Hope you will try this recipe to make one of your chilly winter afternoon to a time of family, fun and frolic. Wish you all a very Happy and Prosperous New year 2014. Stay happy, Stay safe, Stay healthy and stay Blessed. 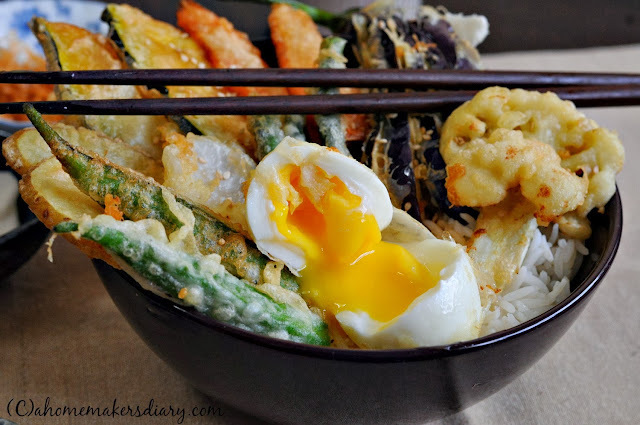 Beautiful and delicious tempura Satyani. Happy new year to you and your family. Beautiful as usual! Happy New Year! What more to expect on cold days...nice fries to compliment the taste. What a great way to kick off the new year with those light and airy tempura! Beautiful and tempting tampura. 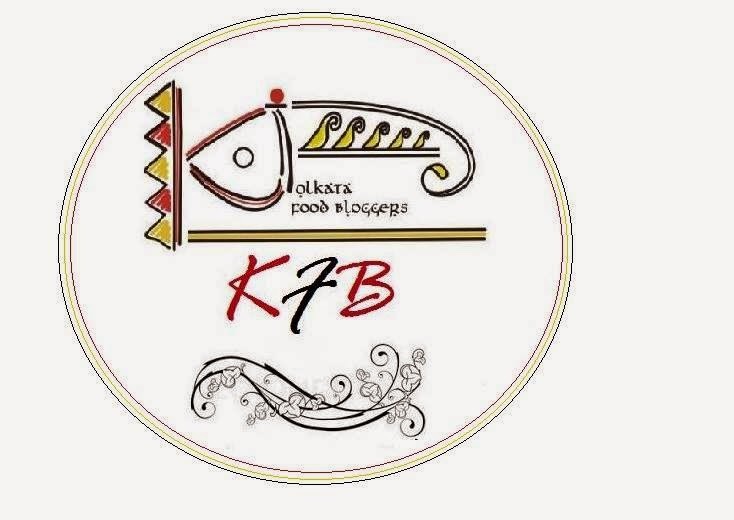 Very new dish fr me but it looks really awesome, sayantani. 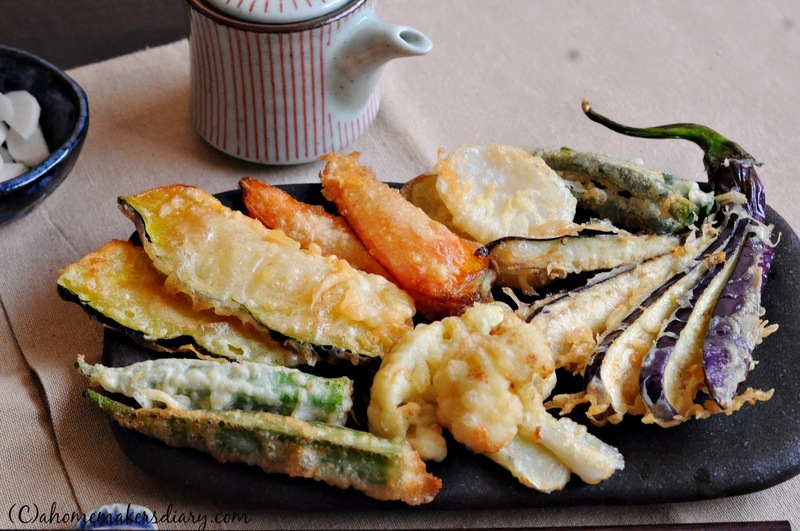 Vegetables tempura is very yummy dish! Thank you for sharing and happy new year to you and yours! Yummy platter of Tempura... Crispy and delicious. Feast for my eyes, feeling hungry. 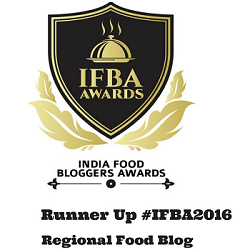 beautiful picture, recipe & writeup sayantani. Your blog reminds me of all the loved and cherished experiences from home & from my childhood. In a faraway country, I took a long time to adjust to the lifestyle& the isolation (even though I work full time at a great job:)). It took me some years to discover the inner cook in me & the fact that I really enjoyed cooking, mostly to re-create that feeling of warmth & comfort that one derives from home. But now I am a self professed good cook who tries out new recipes & scours the net for new dishes & cooking methods. I completely loved your blog & can tell you are a very nice person. Please keep up the good work!! Hello, I am Francesca, Italian, congratulations for your blog. I have joined your friends, if you want to follow me too. Have a nice day. 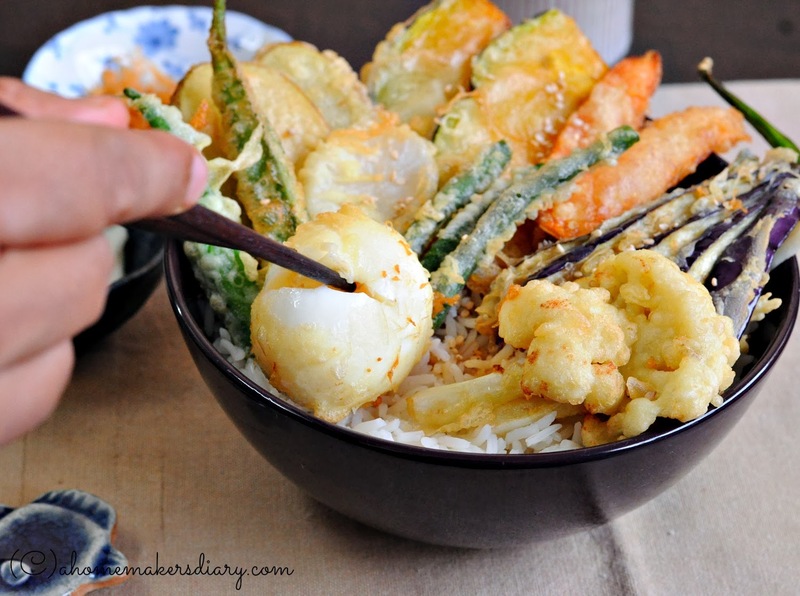 YOu have explained the process of creating a tempura platter so meticulously, I love everything about this post.